And so here comes 2018 ! 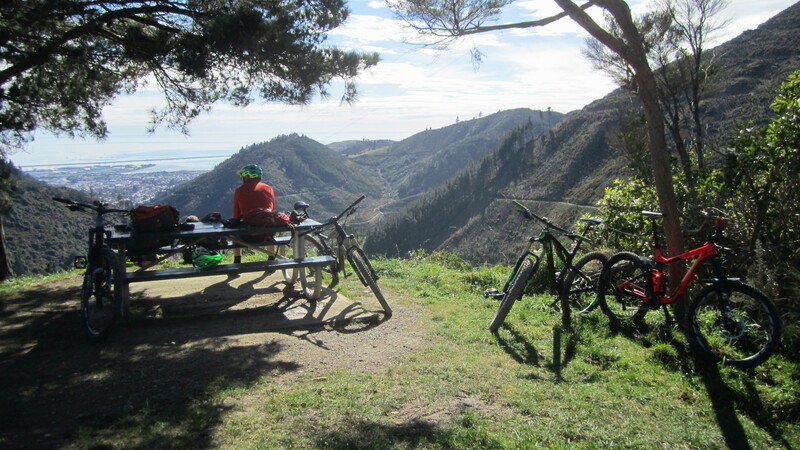 Weekend on the Wairarapa east coast. Just had a great weekend riding the east coast, finding some sunshine and avoiding the wild winds that blow in that part of the world. Below are a few pictures of the trip. 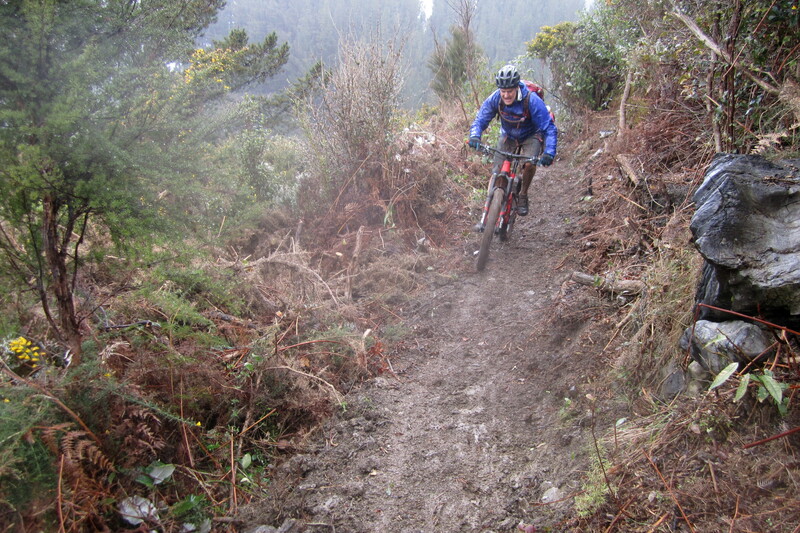 We managed to find some good slip slide mud and pine needles down ‘Willies Way’ through the pine forest. But once we got down to the coast it was a wild but scenic ride all the way to Cape Palliser lighthouse. 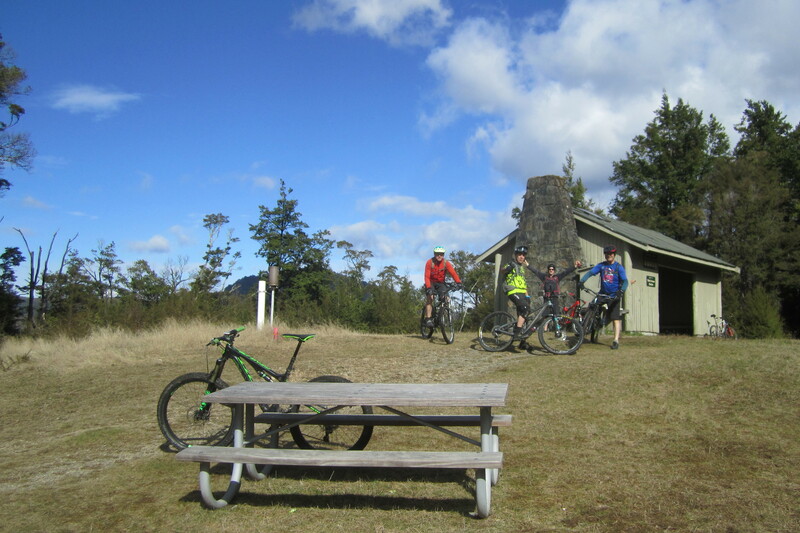 After all that riding it was time for a few beers and some fine food, pizza cooked in the pizza oven for starters and a pork roast for the main course, apple pie for desert and carrot cake to finish off. 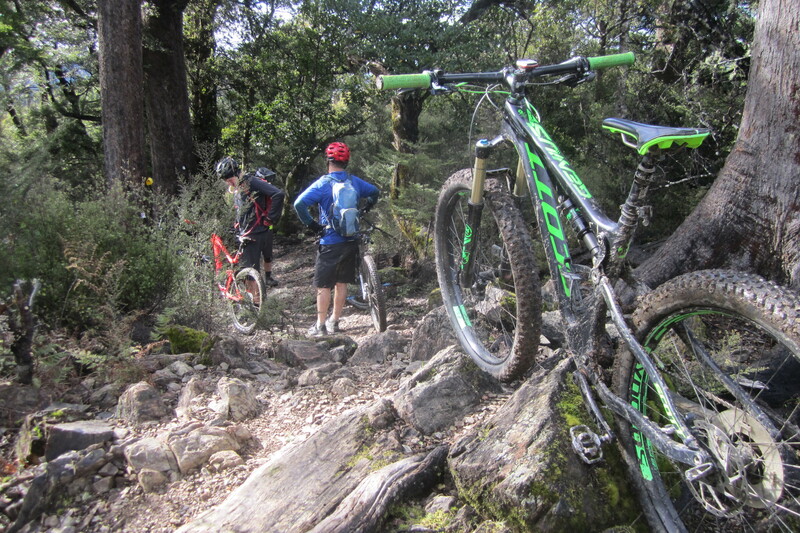 Eating, drinking and mountain biking are a good healthy mix! All of this because it was Dave’s birthday! … who’s next? 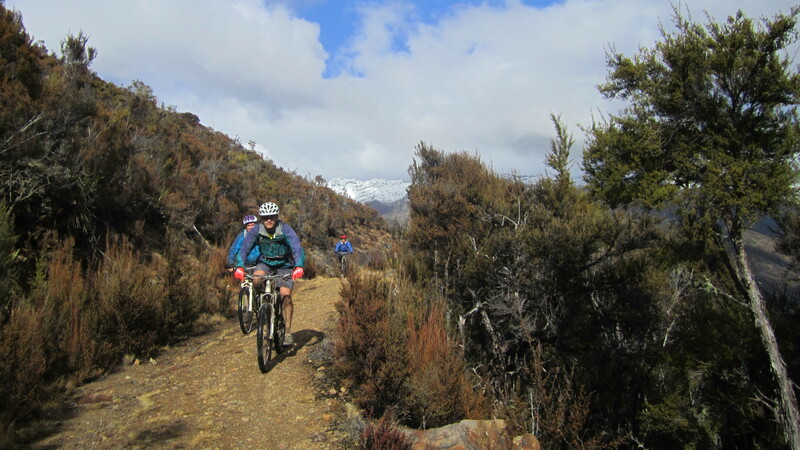 Nelson; Winter rain and sunshine…plus a little snow. After a night crossing on the ferry to The South Island we arrived bright and early into Picton (6:00AM!) 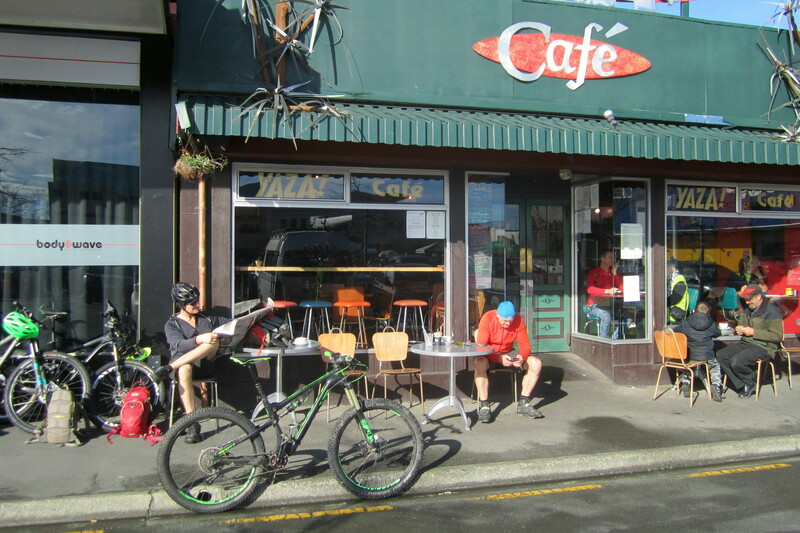 and were waiting for the Café to open in Blenheim soon after 6:30 so that we could consume a substantial breakfast that would help sustain us up the first climb of the day, an 800m vertical climb/walk up a peak affectionately known as Beebys Knob before branching off along Maitland Ridge. 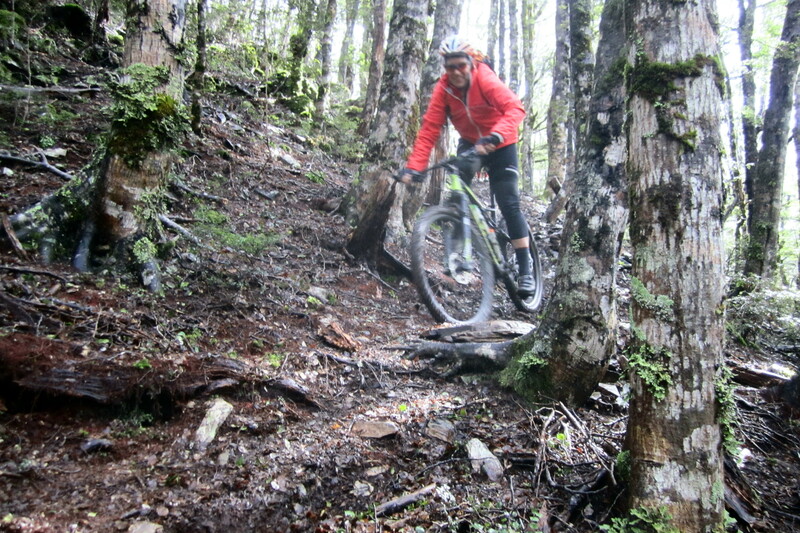 At 1350m we were high enough to catch some of the snow that fell earlier in the week, and at this time of the year it was no surprise that the track was mushy, that just added to the technical nature of this track. 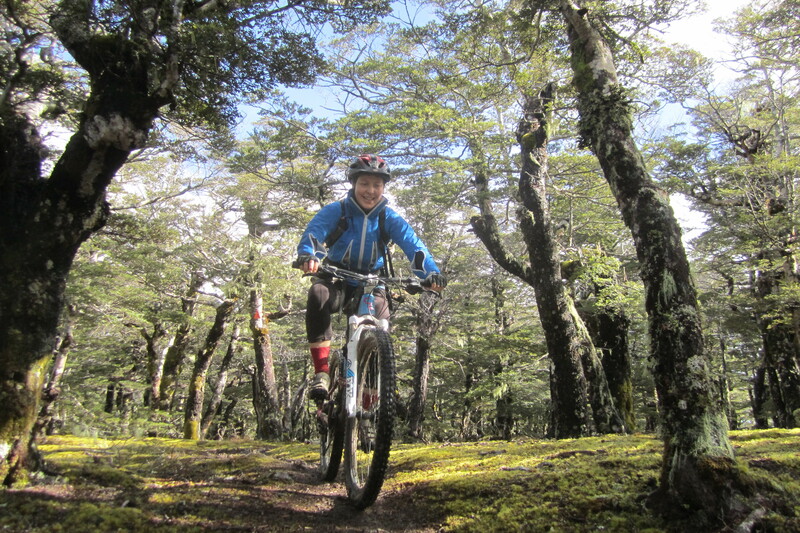 Great riding through the stunted beech trees, plenty of mud and plenty of smiles. 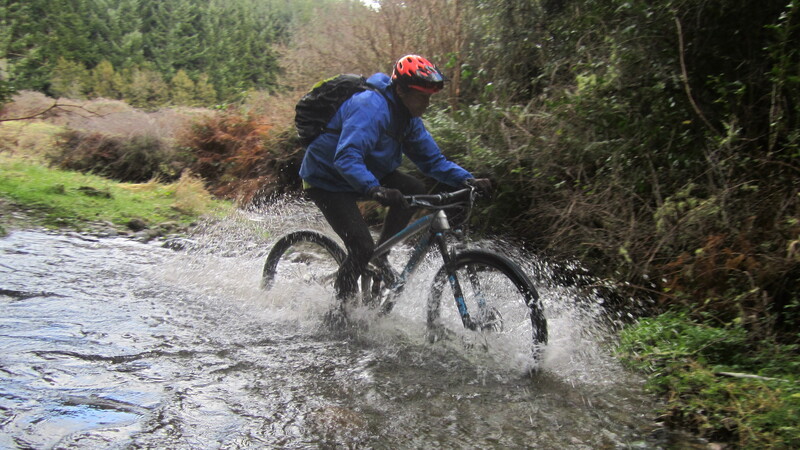 The ride down past Red Hills Hut was fast and furious and the river crossings cold! 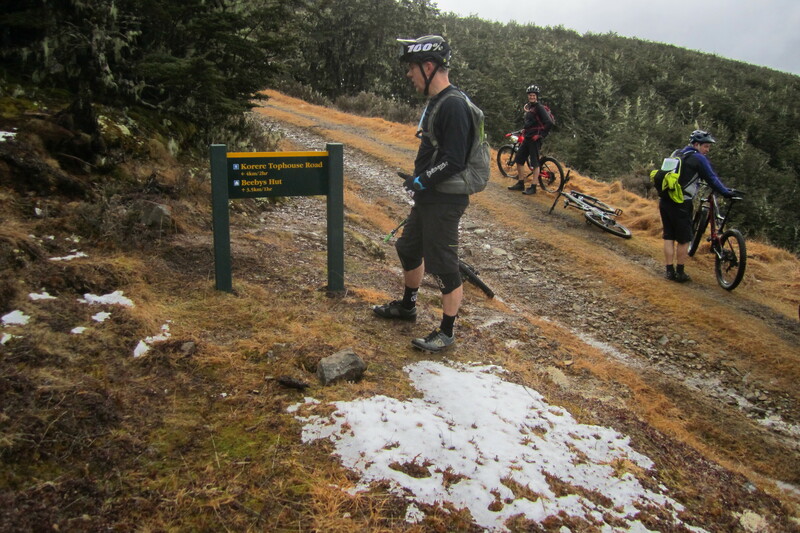 But everyone thought it was a great ride and were keen to get back there in the summer to see if those slippery climbs could be tamed. 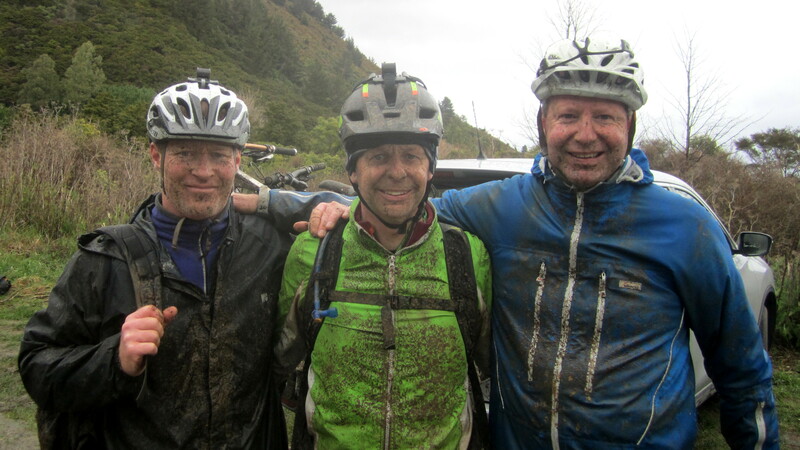 These guys enjoyed the ‘slightly’ muddy conditions! 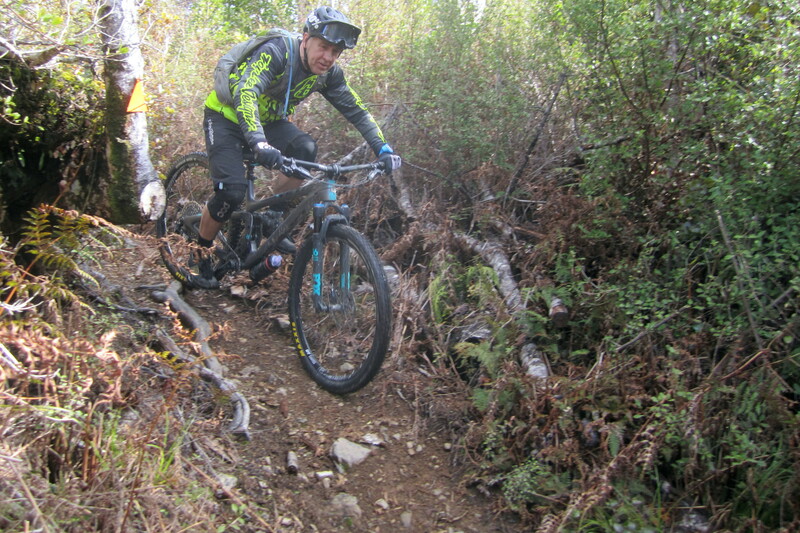 we headed up Dun Mountain to have a go at the grade 4 — 5 trails known as Sunrise Ridge, Cranknstein and 629.
the five of us generally agreed that to ride all of this trail involved commitment that we didn’t quite have as we wanted to go home with limbs in place and a complete set of teeth. 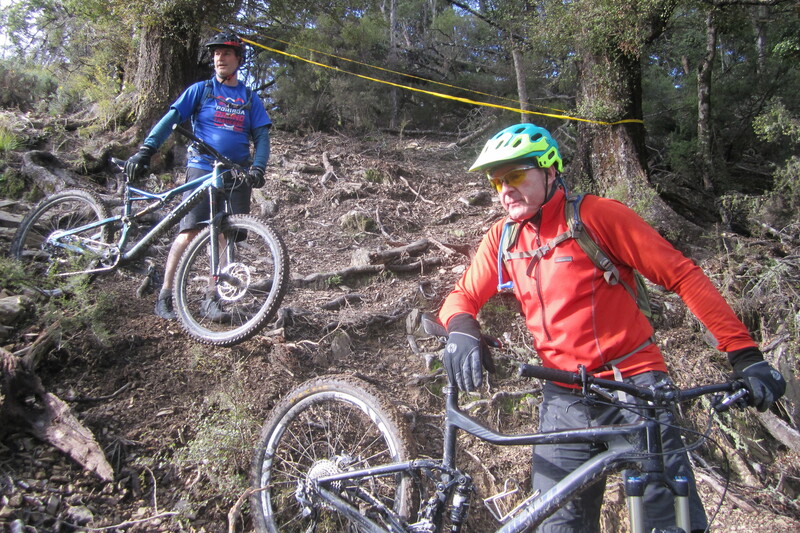 But the sections which were ridable, (for us,) were just great and 629 was more rideable with most riding pretty much the whole track. 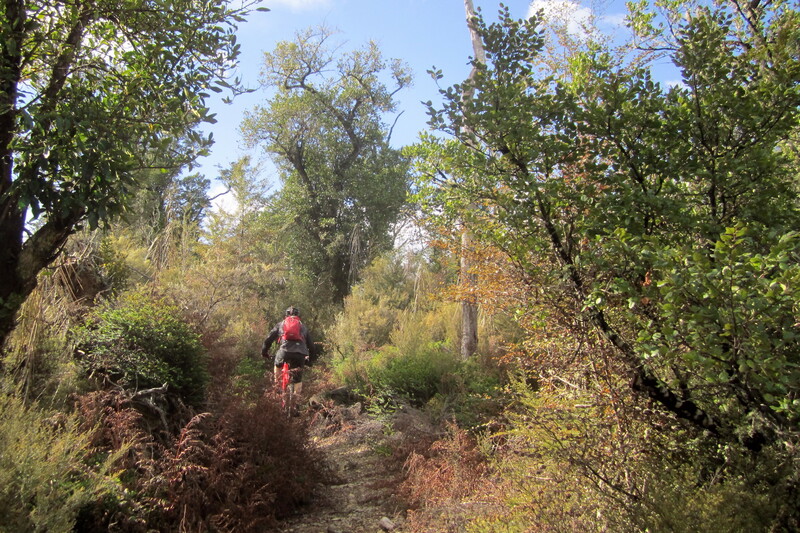 After descending fast enough to make your ears pop we cruised back into the city and topped up with beer and supplies and headed for the shower. A zip up Barrnicot and down Involution finished off day four before a wild return trip on the ferry with 5m swells making a few of the guys feel worse than looking down the drops on Cranknstein! 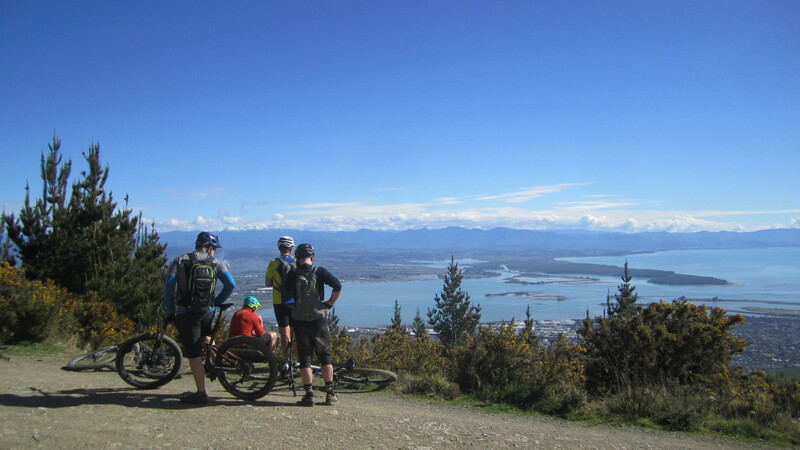 As always there is great riding to be had in Nelson and as proudly stated by their MTB club: Nelson was recently rated by IMBA as a Gold Ride Centre – one of only six in the world. 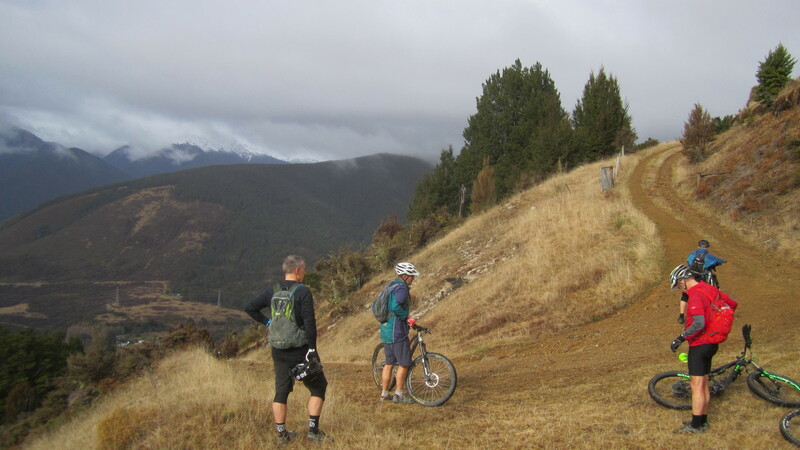 We have been taking time out during the ‘quiet’ season to help out with some trail building and maintenance on our local trails here on the Kapiti Coast. This was followed by a couple of weekends of work parties to get the gravel spread over the track. A further chopper sortie was required to lift two bridge material packages high up to an area where a couple of local creeks need bridging, all we need to do now is dig the foundations and build the bridges. Once these are completed and official sign off by the council is achieved there is going to be a grand celebration! 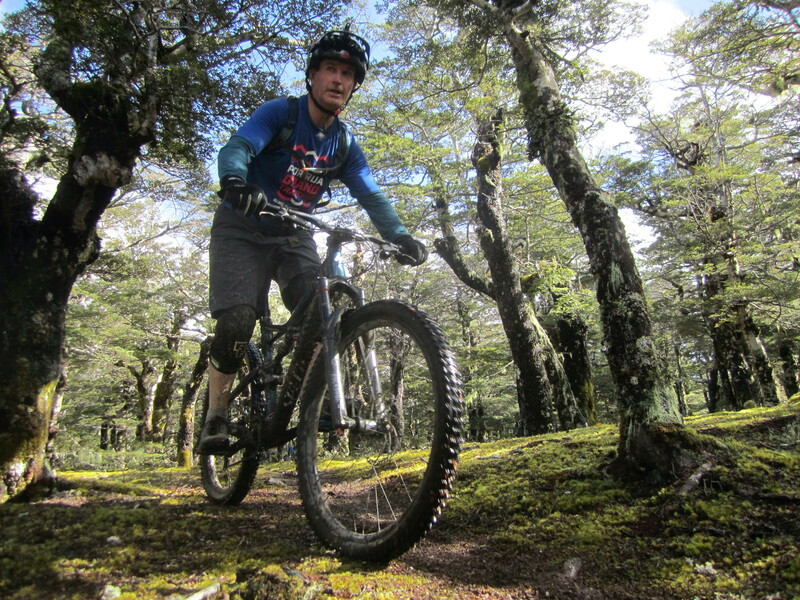 14 day Tour –South Island —March 2017. 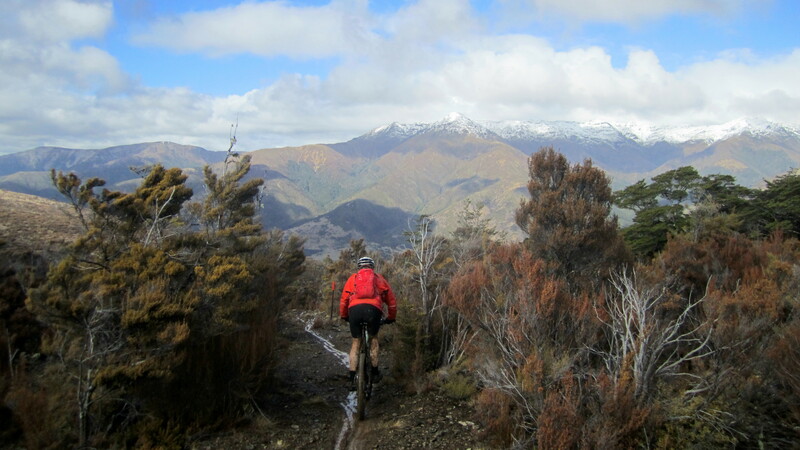 Chasing the earl autumn sunshine around the South Island we had a good hit rate with only a couple of wet travel days and two grey days down in Queenstown, the rest of the time we had those big clear blue New Zealand skies. 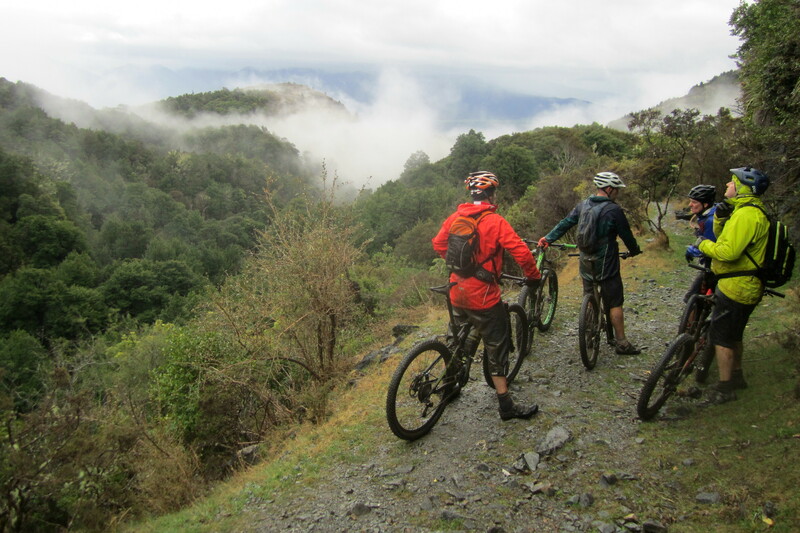 Hanmer Springs; A good weather forecast meant we could commit to a shuttle drop off at the furthest point on the St James Cycle Trail and bid farewell to our driver Andy and head over Maling Pass into the big wild and remote Waiau River Valley and the start of a 70km return to Hanmer Springs through the St James Station. 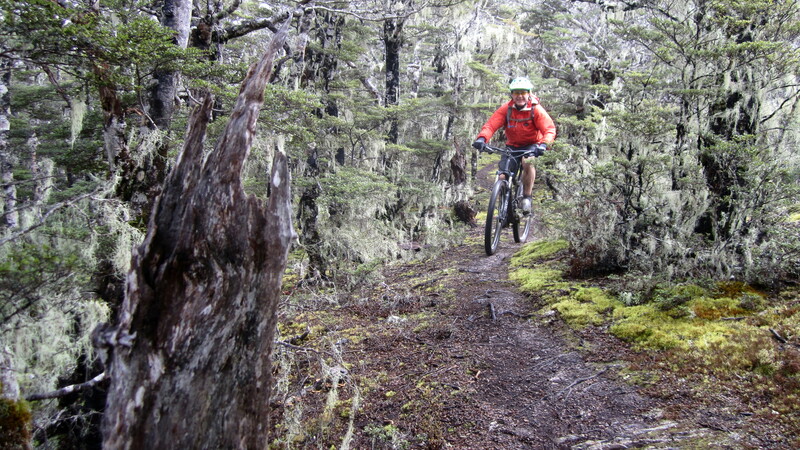 This is big country with views to match of the surrounding 2000m peaks, throw in a couple of suspension bridges over the river and three passes to climb before the return to town over a final pass and a newly reopened pack-track down onto the Hanmer Plain, and you have the recipe for an epic adventure ride . 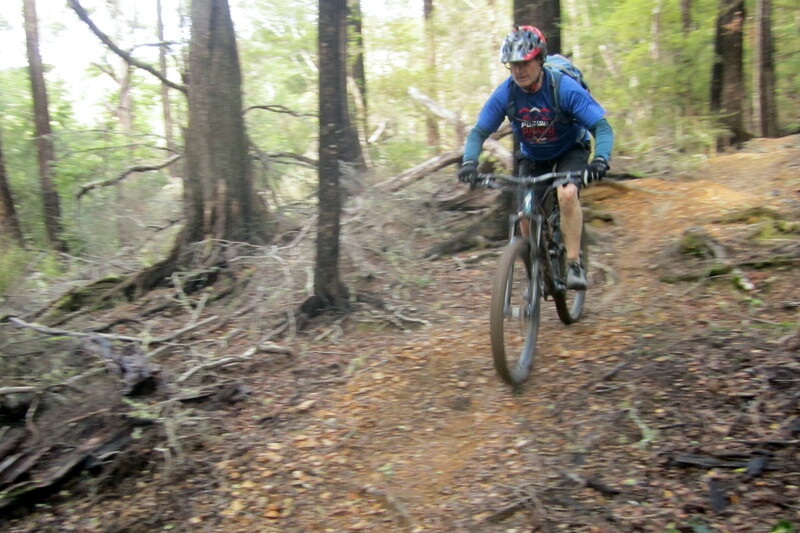 In Reefton we had a trip around the old mining tracks at the back of Blacks Point; there are some great sections of single track linking the mining sites, sometimes we were rewarded with relics from abandoned mine workings slowly disappearing back into the forest surroundings. After a stop at Ces Clarks Hut for an early lunch we then diverted to Garden Gully Battery to help explain the difference between this style of battery and a Duracell 🙂 before finishing with a glass of beer in the Blackball Hilton and heading on for Hokitika. 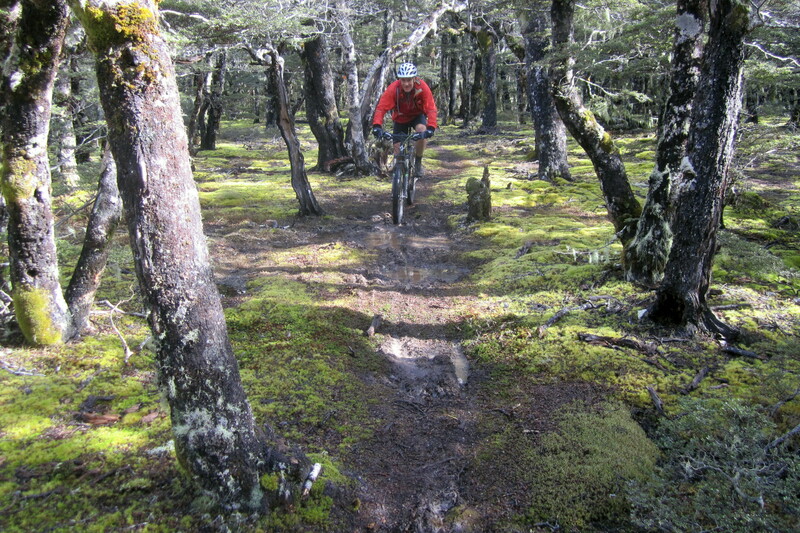 Catching a dry day on the West Coast meant we could take on the West Coast Wilderness Trail and knock off the best section from Kumara back to Kaniere giving us 60km of grade 2 cruisy riding, but just so that it wasn’t ‘too cruisy’ I added in the 7km of the Old Water Race track which cranked up the difficulty to grade 3, grade 4 with some step sections thrown in, this made sure Chad and Peta were properly worn out, therefore receiving excellent value for money times distance travelled! 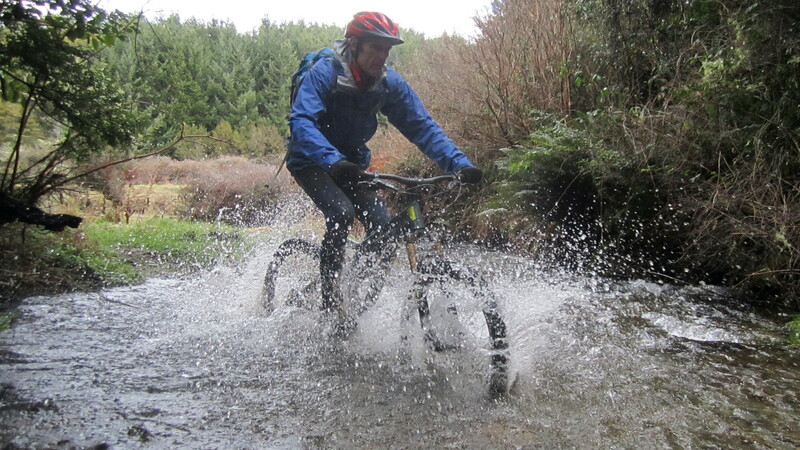 The rain caught up with us for the next couple of days and we used some of that time travelling the 500km down the West Coast to Queenstown with an overnight in Makarora on the way. 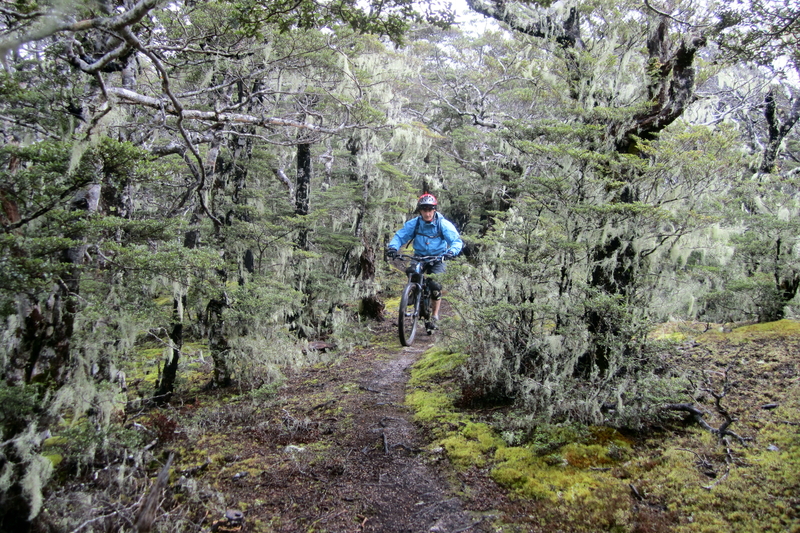 and followed that with a circuit of Moke Lake, bumping into a few locals along the way. 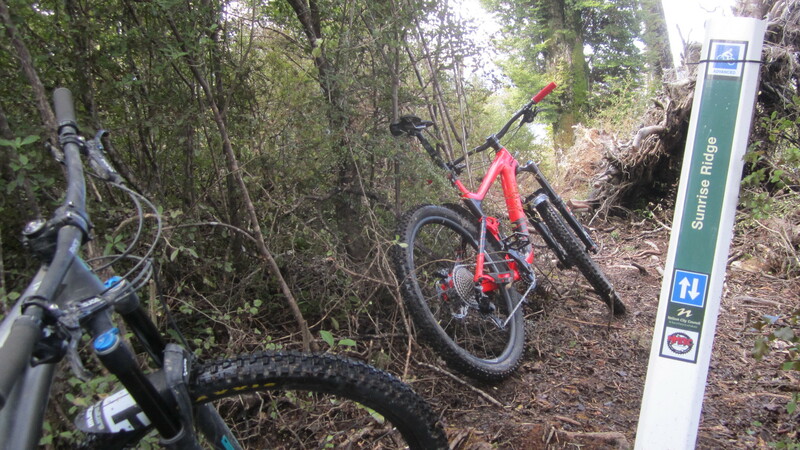 in-between times we had a few runs of ‘Zoot’ and finished off the day with the ridiculously steep Slip Saddle which drops you into the gentler ‘Bush Creek’ ride through many creek crossing all the way back to Arrowtown. It would have been more sensible to join the paragliders and descend gentle to earth rather than plummeting down Slip Saddle! 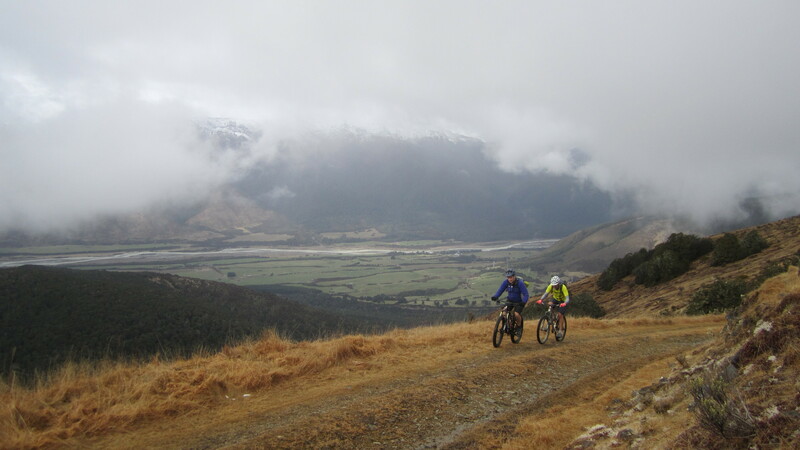 Departed Queenstown for Tekapo and an overnight stop in a neat Shepherds Hut 7km along the lakeside where the following morning we had a ride through the local forest and on the trails above the town with great views of the lake and the Southern Alps. 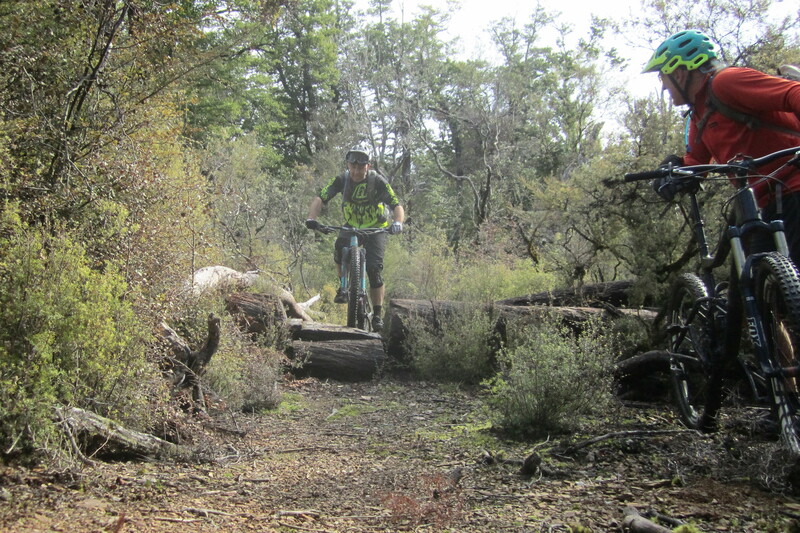 I get to do this all over again sometime… some folk have to go back to 40 degrees in Perth… darn good excuse to call by this way another time I would think! Finished off the tour with a few beers to help fill the kitchen shelf and a pie from the famous Sheffield pie shop. 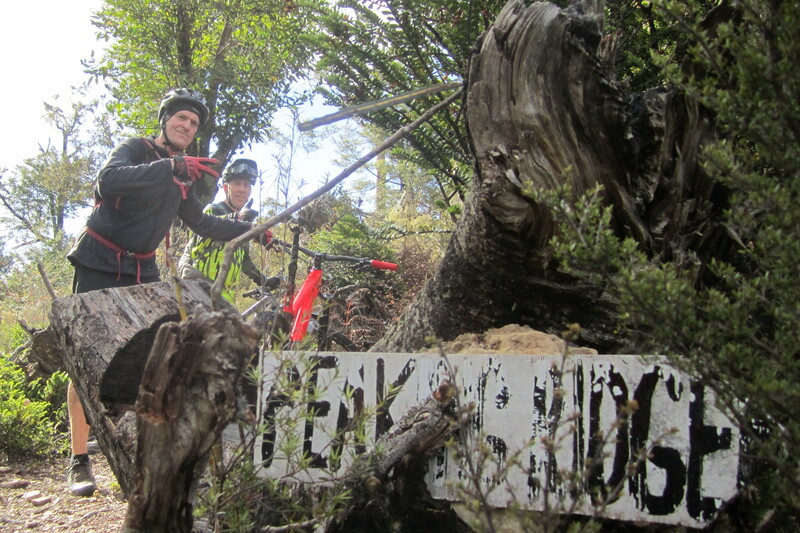 31 photographs covering 21 days from Whakarewarewa Forest on the North Island to The Craigieburn Mountains on the South Island. They say a picture is worth a thousand words (“They” either being early Chinese or 20th century Americans depending on which translation you read or who might have first said something similar!). 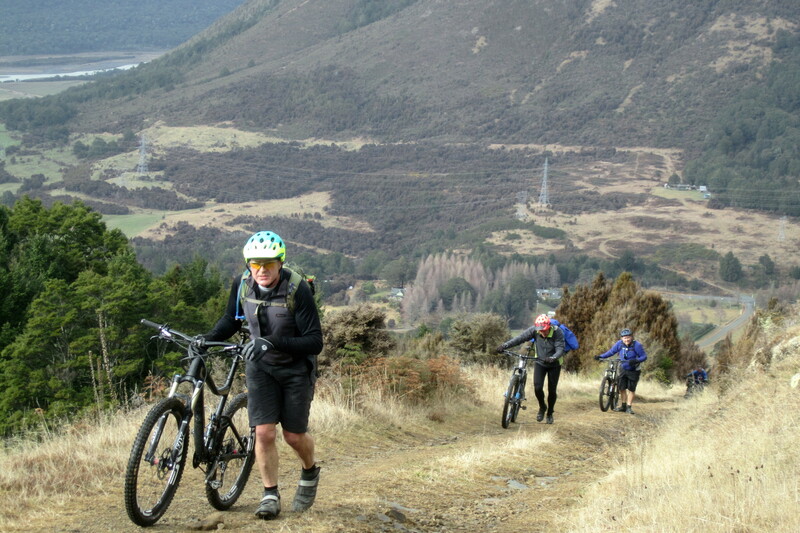 and so here are 31 pictures covering 21 days and 11 major rides across New Zealand. 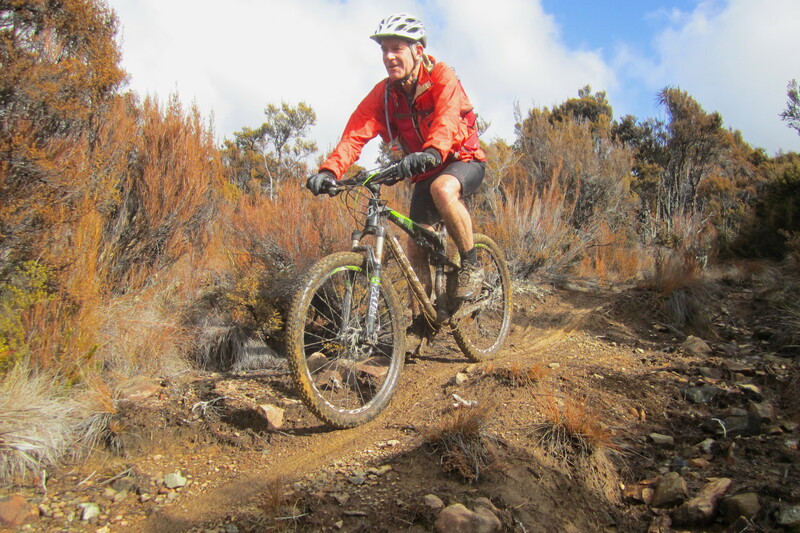 Started off this year with a One on One tour for Ross from sunny Queensland, Ross was used to Australian temperatures and so although I was riding around in a short sleeve shirt most of the time, Ross usually had his merino base layer on! 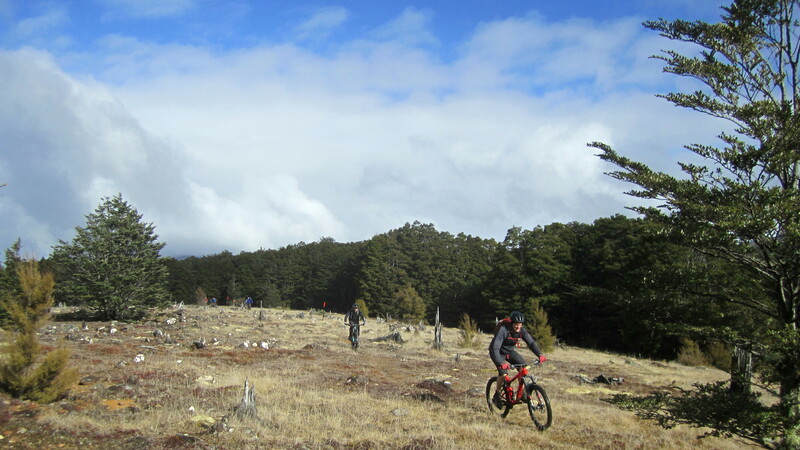 Started out with some excellent riding on the Craigieburn trails and as the weather turned bad on the West Coast we stayed an extra day and rode the trails we had missed on day one, lots of pictures because of the great weather on that side of The Divide. 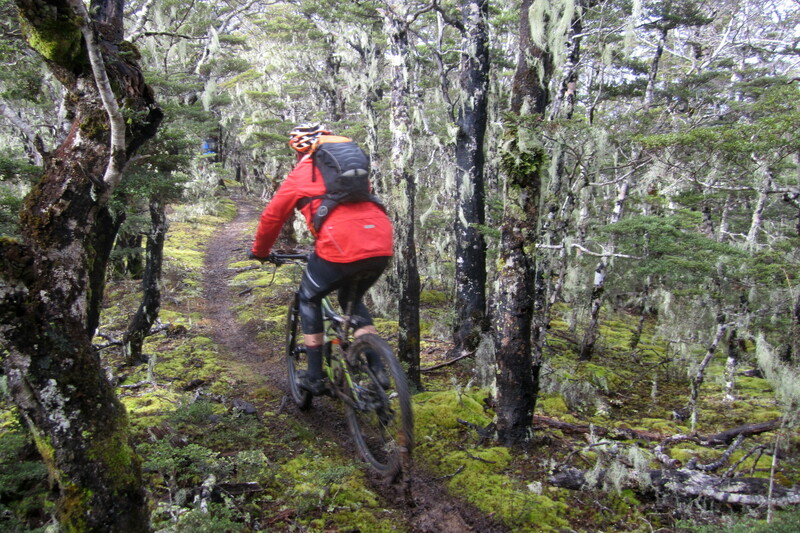 Zipped up through Arthur’s Pass and cut back inland to Reefton for a late fish-n-chips and a late start the following day to let the rain subside and the sun to come out so that we could tackle the long climb up Kirwans Track. 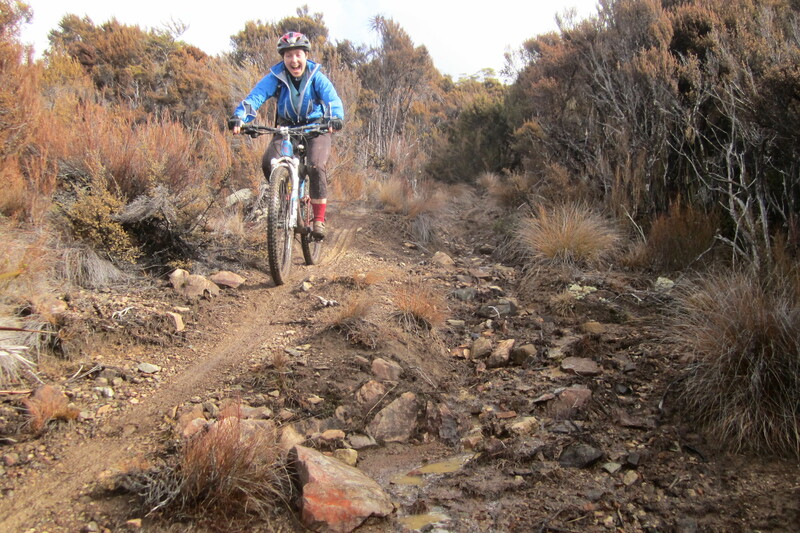 The track was very soft after the overnight rains and so the climb was very slow with us not arriving at the top until 4 hours had passed. Found ourselves a friendly Robin at one of the snack breaks; didn’t see him on the way down as we made up for our slow climb with a one hour twenty minute return run. 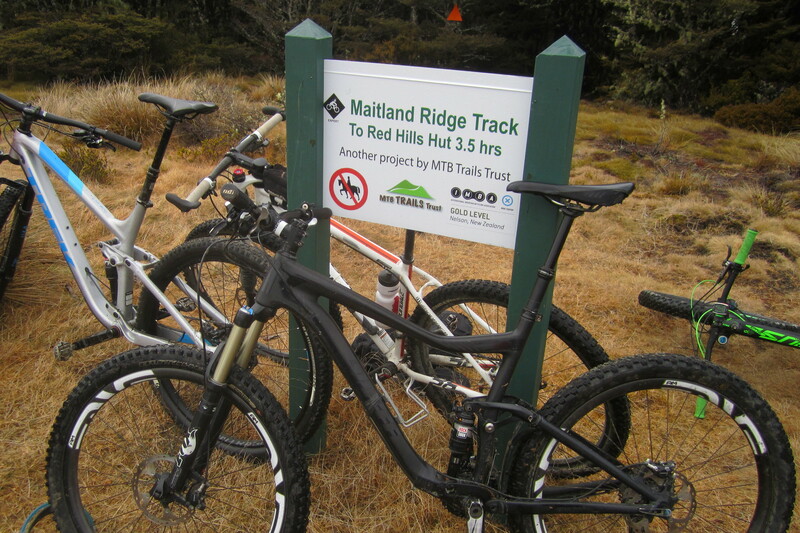 Up onto the Denniston Plateau the next days to see how the track network is there, fortunately the good guys from Habitat Sports in Westport are busy improving the tracks and upgrading the signage. There is even a gorge up there full of trees amongst the otherwise baron landscape. 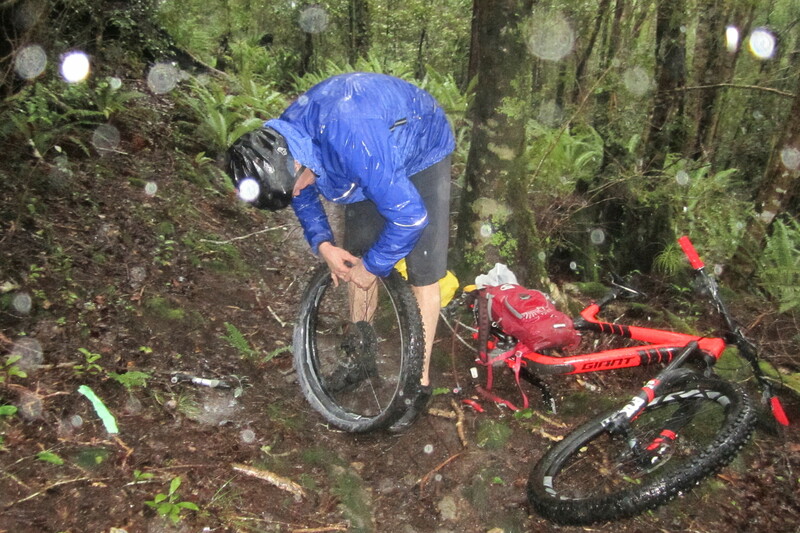 Again after overnight rain we headed back through the Buller Gorge and stopped off in Lyell for a there-and-back to Lyell Saddle Hut on The Old Ghost Road, the rains had made the track pretty damp which wasn’t a problem on the slow climb but we ended up wearing most of the track surface on the way down! 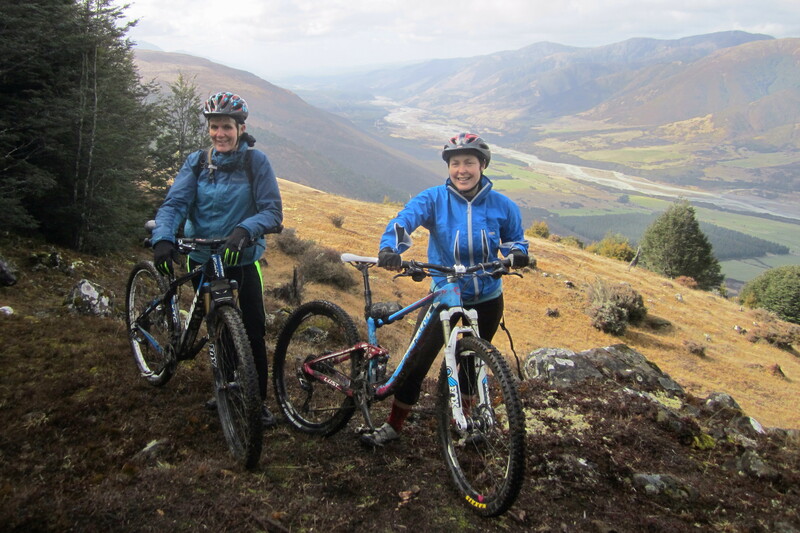 Nelson was our next port of call where we took on Involution and the Dun Mountain loop in warm dry conditions. 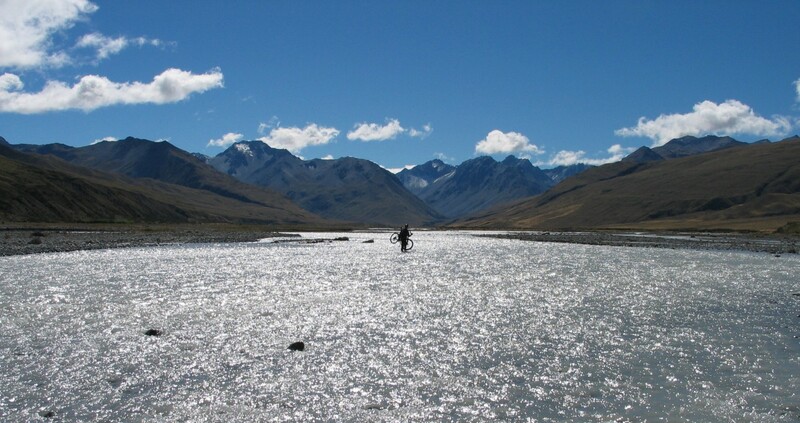 The forecasted ‘weather bomb’ then began to develop as we headed through Lewis Pass in torrential rain but broke out into sunshine as we approached Hanmer Springs only to then hear on the news that the pass was closed by flooding and land slips. 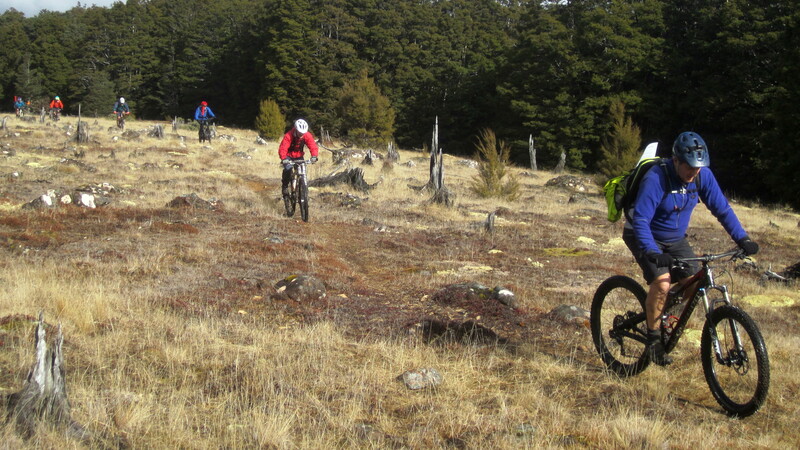 After Hanmer we opted to try out the new Adventure Park in Christchurch with its chairlift bike shuttle options. 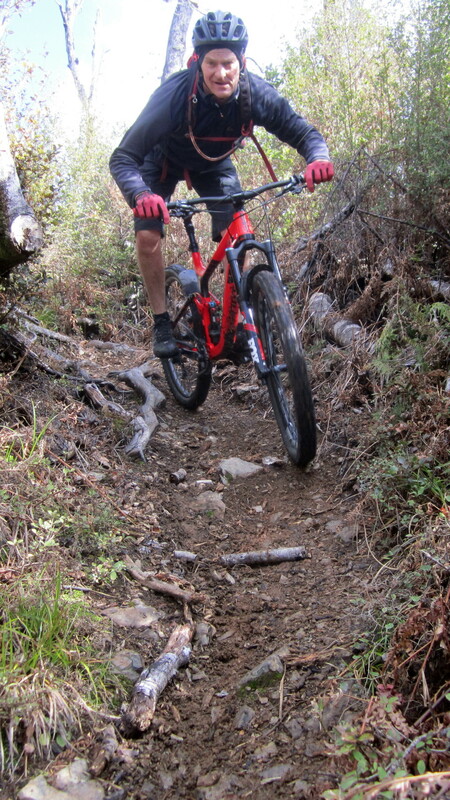 Great way to finish off a trip with 1280 vertical metres of descent and the chairlift taking care of the up. After all that riding I packed Ross back off to Queensland so that he could get back up to his regular temperature! 8am -- 8pm 7 days.